You’ve been trying to restore an iCloud backup but all your iPhone says is that it cannot restore backup. No matter how many times you tried, it still failed. And so you’re wondering why the iCloud restore process failed and what must be done to get your new iPhone 7 to restore from an iCloud backup successfully. If you’re here for the same dilemma on the same iOS device, then I suggest reading this entire post to get some basic tips on how to fix it. Many users of the new Apple iPhone 7 and iPhone 7 Plus have reported a similar issue in which they are unable to restore their new iPhone from an iCloud backup. It occurs a few minutes from the iCloud backup restore instigate and then users are prompted with an error message saying that their iPhone 7 “Cannot Restore Backup” and therefore cannot import data and settings from an iCloud backup to the new iPhone. What could be the reason why you couldn’t you restore an iCloud backup to your iPhone 7? It’s possible that the backup file you’re trying to restore is corrupted and therefore it could not be restored to your new iPhone. You should consider this among other factors. Some people thought that the problem is triggered by a network issue like the iCloud server might be temporarily unavailable or other issues affecting iCloud services. Meanwhile, other cases in which the user gets the same error message while attempting to restore backup from iCloud on their iPhone were tied to a faulty software update. As a matter of fact, several iPhone users have raised the same complaints on being unable to restore backup from iCloud after installing the latest version of iOS 10 software on their respective iPhone devices. In the latter case, it could be due to a software bug that needs to be addressed by Apple in their next iOS update rollout. But in most cases, the error is found to be triggered by a conflict between iOS versions in both the backup device and the new iPhone 7. As what was explicated by other users who have encountered the same problem, an iCloud backup restore won’t go through if the previous (backup) device runs a higher iOS version than the new (restore) device. For example, when the backup is in iOS 10.1 and your iPhone 7 is still in its original iOS 10 version (as you haven’t updated it yet), then you should expect a similar problem to occur during the restore process. And this is what the error on “Cannot Restore Backup” usually denotes. Highlighted below are standard solutions and troubleshooting methods used in dealing with any problems on restoring iCloud backup on an iPhone including the one that is manifested by the error abovementioned prompt. Feel free to try these methods first before contacting Apple Support for further assistance. Step 1. Verify and ensure that Wi-Fi is enabled on your iPhone 7. A stable Wi-Fi connection is among the requisites when restoring from a backup through iCloud. But being connected to a wireless network may not guarantee a successful restore. You have to ensure that your connection is stable. Doing so will prevent any interruption, which may likely result to anew problem. Step 2. Restart or force your iPhone 7 to restart. Again, just like with any other software-related issues, performing a simple restart might just be the thing you need to refresh everything in your device and complete the backup restore afterwards. It is highly recommended to restart your iPhone every time you encounter an issue, which is likely triggered by random software glitches. To reboot your iPhone 7, press and hold the Sleep/Wake button for a few seconds until the red slider appears. Drag the slider towards the option to completely turn off your iPhone. Wait for 30 seconds and then press and hold the Sleep/Wake button again until the Apple logo appears. Alternatively, you can force your iPhone 7 to restart by pressing and holding the Sleep/Wake button and the Volume Down button simultaneously for at least 10 seconds and then release both keys when the Apple logo appears. Step 3. Update to iOS 10.3 or 10.3.beta 6 (if available). Check for the new iOS updates available for your iPhone 7 and try to update iOS to the latest version. Should the problem is triggered by a software glitch or some bugs in the current operating system, then most likely that should be rectified by a software update. Small updates like 10.1, 10.2, and 10.3 may contain fixes to existing bugs including the ones messing up with the iPhone 7 iOS. Step 4. Use alternative software. As alternative solutions are usually third-party developed applications for your iPhone. They are created for specific purpose and functions. Just like data recovery software for iPhone. These tools can come in free versions while others are for purchase. You can try some professional iPhone data recovery tools to restore data from iCloud backup to your iPhone 7 if the usual process won’t go through. All you have to do is to visit the App Store and search for the best possible software compatible with the current iOS version your iPhone is running on. But before you download any of these tools, you might as well consider reading prior reviews to find out how it actually works based on other users’ experience. Aside from the standard solutions, there are also some other important factors that you might need to re-consider when performing an iCloud restore on your iPhone. The following should serve as additional hints for you to refer to. Step 1. Wait a little longer as the iCloud backup to restore might be a huge file. If you’re getting a message saying that your iPhone 7 is being restored but takes a long time to finish, then try to check if your device is connected to a stable Wi-Fi network. The backup restore process could take longer depending on the size of your backup and the Internet speed. Also be sure to connect your iPhone to a functional power source until the restore process is completed to avoid any interruption that may result to corruption of data. Step 2. Check your Wi-Fi connection and make sure it is active and stable. If you’re getting a message saying that your last backup could not be completed, then try to check your Wi-Fi and make sure it’s active and that you iPhone is currently connected to your wireless network. Remember that you cannot restore from an iCloud backup over a cellular network connection. If you’re prompted with an error message saying that your restore is incomplete or some items won’t restore, then this could mean that you disconnected from Wi-Fi during the restore process or that some of your apps or content could not be restored. Step 3. Create another backup through iCloud and try to restore it on your iPhone 7 again. Considering the possibility that the backup file has become corrupted during the previous backup process, you might as well consider trying to create another backup to iCloud and then restore from the new backup at this time. Apple is pushing out minor updates more often or periodically. Say for instance, the iOS 10 now has minor updates such as 10.1, 10.2, and 10.3. And that .1, .2, or .3 are enough reasons to mess up with the iCloud restore process. So if your iPhone 7 says that you “cannot restore backup” perhaps it’s because the version of iOS on your iPhone 7 is older than the version of iOS that made in the iCloud backup. That being said, make sure that the backup is on lower iOS version than the one you are restoring to. For example, if you back up a device on iOS 10 make sure you restore to a device on iOS 10 or higher. So it should be like the iPhone 7 needs to be running on iOS 10.2 or 10.3 to allow a restore from an iOS 10 or 10.1 device. Otherwise, you will still have to update your iPhone 7 to the latest iOS version available and the restore problem resolves itself. Connect your iPhone 7 to a computer running the latest version of iTunes. Put your iPhone 7 in DFU mode or Recovery mode. Finally, select the option to Restore from an iCloud backup. After that the restore process should run smoothly, given that both the old and new iPhone are running the same iOS version or the new iPhone is in higher iOS version than the old. 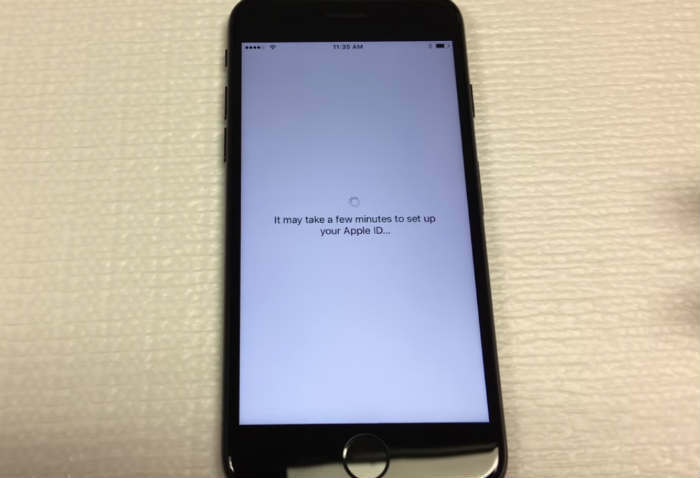 If none of the recommended workarounds is able to fix the problem and that you’re still unable to restore an iCloud backup on your iPhone 7, then at this point, you should contact your device carrier or Apple Support to escalate the issue and ask for further support or other options.